Boris Yeltsin evokes complicated feelings among his fellow countrymen, but in the end, he did more good than bad. I talked to him only once, in 1990. I was a young TASS reporter in Moscow attending his meeting with a delegation of Polish parliament. He was just elected to be a chairman of the Supreme Soviet of the Russian Federation. After the meeting I was supposed to get his clearance for the text. He said: “As far as I can see, you are an experienced man (it was not true by any means). It will be up to you to decide.” Yeltsin said and shook my hand with his big one. My friends evaluate him differently. Those who worked with him--with a few exceptions-- say he was a great statesman with enormous charisma. The best characterization came from Strobe Talbott, who once said that Yeltsin had a volcanic character. He could be unpredictable, but his political instincts were without comparison on the Russian political scene. I have also heard the opinion that Yeltsin brought the country to its knees, and that he made several crucial mistakes--including the process of privatization, during which mobs and thugs took over Soviet property. He also started a war in Chechnya and brought into power as his successor “someone we won’t be able to get rid off for a long time.” But for me this is a simplification of Yeltsin. His proponents say that Yeltsin brought Russian freedom and liberty. Others say it was Gorbachev, not Yeltsin who initiated freedom of the press (“glasnost”); opened the Soviet Union for foreign travel; arranged the first democratic and alternative elections; published Solzhenitsyn; and refrained from using force against the opposition. The mid-1980s was a period of expectations for Russians. Gorbachev looked like an unusual and promising individual compared to his grey-faced colleagues. However his goals were not clear, and over time it was clear that he cared much more about his Communist party friends and his political ambitions. 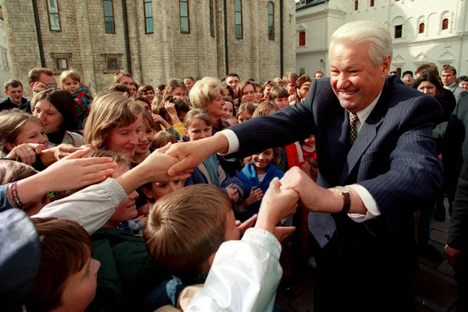 Yeltsin looked like a doer, a fixer, like someone who is capable of bringing real change. And indeed he brought it. Yeltsin revised and changed the traditional Communist ban on private property. And that was his most significant achievement. Yeltsin did not make everyone in Russia happy; the national minorities are a significant part of the political life. Complicated ethnic conflicts in the Northern Caucasus – the aftermath of the Soviet national policy and the result of a vacuum of power in the societies, where feudal instincts were still quite strong – did not give him much choice. I strongly supported his actions in 1993 against the Supreme Soviet, whose members arranged, as Anatoliy Chubais properly said, “a military-fascist coup” against Yeltsin. I understood the fragility of the economic model that he built in the early 1990s and predicted the default of 1998 which was a turning point for Russia and Yeltsin himself. From 1998, he was a different Yeltsin, exhausted by political struggle. He was a human being who was not free of bad habits. He had a serious heart problem and made too many difficult decisions. He started to criticize America and openly argue with his friend Bill Clinton, the U.S. President who cared and devoted more attention to Russia than any other president in U.S. history. He was no longer the same person we pinned our aspirations and expectations to in 1987. At his resignation, he again showed himself to be the same man we liked so much a decade earlier: A human being who was capable of a gesture, of a step, of a deed. He asked for forgiveness. That is something that not many politicians can do. I would remember Yeltsin as someone who cared about his nation and as someone who always felt himself to be on the side of the virtue of good, on the right side of history.